This entry was posted in Economy, Eurocrisis, Finland, Industrial Relations and tagged exports, Finland, OECD, ULC. Bookmark the permalink. Exactly. Since the lack of “competitiveness” is due to the fact that demand for electronics and paper industry products is low (overall in the worlds but especially in Finland since 80% of its export is based on production) and NOT solely on “lazy” people or inflexible wages. The only solution is innovative products and services to new market areas. Finland cannot compete worldwide by being the slave workforce of multinational companies or if the only tax income is based on services for the elderly. And now the government is cutting directly from those universities that could bring newer innovations into newer markets (Aalto). One of the biggest mistakes ever is to cut off trade relationships with Russia. No mater what happens in politics economics should be kept out of the picture. 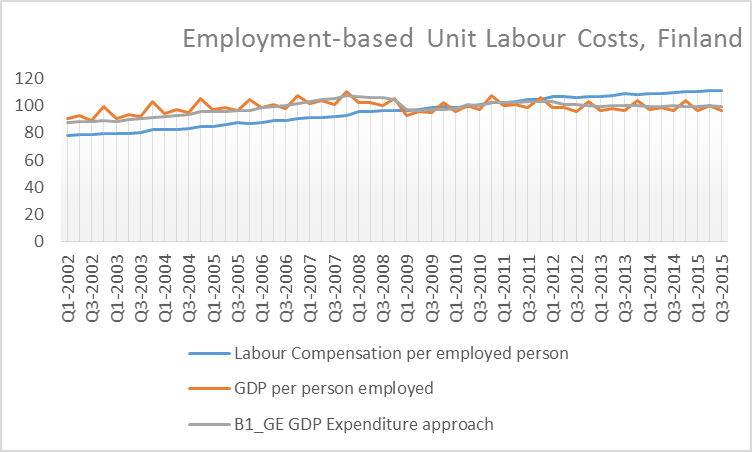 At least a hefty compensation from the EU for the huge impact on the Finnish economy is due. But perhaps the biggest problem that this Government has done is to treat refugees and migrants. NO other country in the world has ever turned a refugee influx into a prospering economy without slave labor. It has always involved migrants and even then its hard. Finland has 500 000 unemployed and the moment so why not add 100 000 – 300 000 (with family reunification) to the queue? And on top of that why not restrict the building of cheaper rent apartments? The situation is exactly the same as Sweden 10 years ago. And what happened there – 52 no-go areas. How has that improved the economy? I have to admit I have never met a government so self-centered and loathing innovations and education. So arrogant as to think people CHOSE to be unemployed or that criticizing the misuse of the asylum-system is a form of racism? I guess that what money gets you. I sympathize with the government – the previous governments made huge mistakes and it is good they try to fix them. But the approach is so bad and amateurish it is nearly tragicomic. And to put the immigrant crisis as a secondary priority is just ridiculous.